Last week brought to us Castle Wars & Snowball Updates, as well as new Danish translation! Let's look further into the changes! Danish language support was added! Giant thanks to fahvi for translating server content to Danish! Wizard uses magic to make enemy arrows not hit allied units in radius of 2 at the cost of a small amount of his health. Wizard attacks using spikes which appear from the ground below the feet of the enemies. Spikes deal 9 damage with a 5-second cooldown, ability drains wizard's health on use and only works in 15 block range. Exploding walls is now harder. Walls will first become cracked and only afterwards could be destroyed. Walls now have proper gravity! No flying blocks would appear. Use RMB while looking at a wall block and holding Place Brick tool while not being in building mode. You get 1 Stone for selling normal wall block and 0.5 Stone for selling cracked wall block. You cannot sell walls if there is enemy troop within 10 blocks radius of it. Archers now only rotate their head instead of adjusting the position after they miss a shot. Archers now run away and shoot back when enemies are too close. Archers are now unable to shoot for 0.5 seconds after receiving a melee/projectile hit. Creepers now take x2 longer to explode. Creepers now have fuse animation like in vanilla & enter fusing state. Creepers will now explode eventually when they get damaged by melee attacks a few times. Attack Speed and Line of Sight stats are now tracked in the unit training menu. If your army is under attack, it is now getting shown in the title. 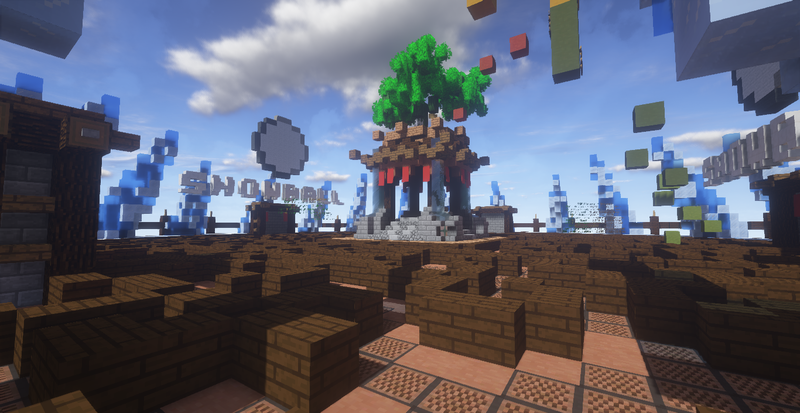 New awesome lobby was built by Build & Out build team for our server! Fast Snowballs: unexpectedly, it makes your snowballs always go fast. No Compass: disables compass in the game. Snowball speed is now tracked using the XP bar. GL-187 Whenever you win, you also automatically lose in Castle Wars. GL-194 Infinite fly & castle wars hotbar items exploit outside Castle Wars game. GL-195 Map resets incorrectly in Castle Wars. GL-196 You get more XP from inflicting fire damage in AbiltyPvP. GL-197 Waiting Queue Status sometimes shows different language than selected. GL-198 Troops do not reset properly on server restarts in Castle Wars. GL-199 Creeper explosion damage is wrong in Castle Wars. GL-200 Super jumps aren't given every minute to players at the low floor in Spleent. GL-201 Team detection of troops makes some troops act weird in Castle Wars. GL-202 Game win rewards are wrong in Castle Wars.